Sometime back I purchased ready-made brown rice which cooks just in 5 minutes in the microwave. I made Chinese fried rice and it tasted very good. It had a nice chewy texture and was also very filling. So I wanted to try the regular brown rice and got it from the grocery store last week. While at the store I compared both brown rice and white rice and found that both have same calories, carbohydrates, fat and protein. This really made me wonder what’s the difference then. I bought it anyway thinking that I’ll do the research later. What is the difference between Brown Rice and White Rice? Brown Rice – Only the outermost layer (husk) of the rice is removed. Since the bran is not removed, it is considered as a whole grain. White Rice – The bran layer underneath is removed. In the process of removing the bran, several vitamins, dietary minerals, essential fatty acids and fiber are lost. Even though some of the vitamins and iron are added back to the white rice to make it “enriched”, Magnesium is one mineral that is not added back. One cup of cooked long grain brown rice has 195gm Magnesium, whereas white rice has mere 19gm. Fiber wise, 1 cup cooked brown rice has 3.5 gm fiber, whereas white rice has less than 1 gm. What are the benefits of consuming Brown Rice? 2. Less constipating than white rice. How to prepare Brown Rice before cooking? 1. Washing the brown rice before cooking is key. 2. Soaking it for 2 hours in warm water activates more enzymes in the rice, which makes it possible to obtain a more complete amino acid profile. Check here. The packet comes with clear instructions as well. I’m going to try mine in a pressure cooker. I’ll update it here, once I try it. Now let me proceed to the Dosai recipe. The original recipe is from a Tamil magazine. I’ve changed it a little bit. 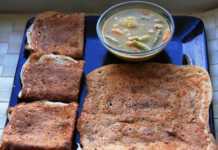 These dosas/adai can be prepared immediately after grinding the batter. Fermentation is not necessary. 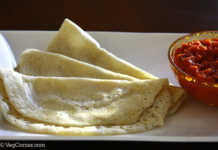 A very simple recipe for preparing savory crepes using brown rice, cilantro and green chillies. Wash the rice thrice and soak it along with the daals in warm water for at least 2-3 hours. Since it was my first time using brown rice, I didn’t know what to expect, so soaked it around 9am itself. If using a blender/mixie: Drain the rice and daal. Reserve the water. Add 1/4th of the rice, daal, coriander, chopped green chillies, ginger and grind it well. Once the cilantro and chillies are ground into a paste, add the remaining rice/daal and the reserved water as required. The batter should neither be very coarse nor very smooth. It should have the consistency of semolina/rava. If using a wet grinder: Switch on the machine. Let it run with the stone. Now pour the 1/4-1/2 cup of the soaked water in the empty grinder, let it run for a minute. Now add 1/4th of the rice/daal and other ingredients and let the machine run for 5 minutes. Later add the remaining rice/daal and water as required. Transfer the batter to a bowl and mix the salt thoroughly. Heat a non stick griddle. Once it’s hot add a ladleful of batter to the griddle and spread it using the back of the ladle. Let it cook for 2-3 minutes. Spray it with a non stick cooking spray and turn the crepes and let the other side cook for another 2-3 minutes. 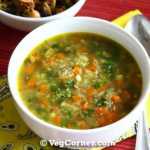 Enjoy it with plain yogurt, idli podi or your favorite pickle. The original recipe uses 2 cups of white rice. I have tried that too and it was more soft than these brown rice dosas. The brown rice dosas had a chewy/rubber like texture. But we did like it. It’s different and I will be making these again. We never eat spicy food, so I added only 3 chillies and it didn’t have the trace of the chillies at all. That’s why I have listed 4-5 chillies in the ingredients. We ate them with idli podi, which was a superb combination. Soak the rice and daals in the morning before leaving for office, come home in the evening, grind the batter and have these delicious dosas for dinner. 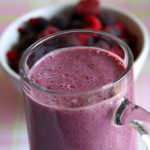 Or else you can soak it overnight, grind it in the morning and start your day with this healthy and filling breakfast. 1. Aparna’s WBB – Grains in my breakfast. WBB created by Nandita. 2. Suganya’s JFI – Whole Grains. JFI created by Indira. 3. Siri’s Herb Mania – Coriander. Herb Mania created by Dee. 4. Sunshine Mom’s FIC – Green. I was about to leave a comment for you about the award on my blog, but I guess now you have seen it. You are super fast! I hope you guys find it in your local Costco store. Ingredients: Oats, White Whole Wheat, Sugar, Triticale, Rye, Barley, Whey, Nonfat Milk, Flax seeds, Millet, Buckwheat, Baking Powder (Sodium Acid Pyrophosphate, Baking Soda, Corn Starch, Monocalcium Phosphate), Salt, Brown Rice, Dextrose, Natural Vanilla Flavor. I can see good 6-7 different grains in this mix. Actually, both my kids like the slightly sweet dosa. Anjali, thank you very much for the detailed info. I think we can use it as a base for other baked goods like scones too. Let me try it. thats very creative & yummy recipe! I sure am nuts about both coriander and dosa, so this recipe sounds like a dream-come-true to me. 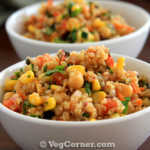 A wonderful recipe as usual, Madhuram. the dosas look so delicious and colorful Madhu! Thanks for the healthy version of dosa. Nice color Madhu..Never made with Brown rice..Will try out soon. one difference between white and brown rice is that brown rice turns rancid within a few months because of the oils in the germ. Excellent recipe, I’ve never seen anything like it. Love the green color, it lets you know that you’re about to eat something flavorful and delicious. 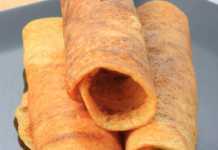 They look too delicious and healthy madhu..I should try this..
Nice…… Brown rice and cilantro dosa. I think it would be a good combo. Will try it as soon as I get a chance. Lovely color, would like to know the name of the pancake mix from Costco. I have not used the pancake mix. It’s Anjali’s comment. 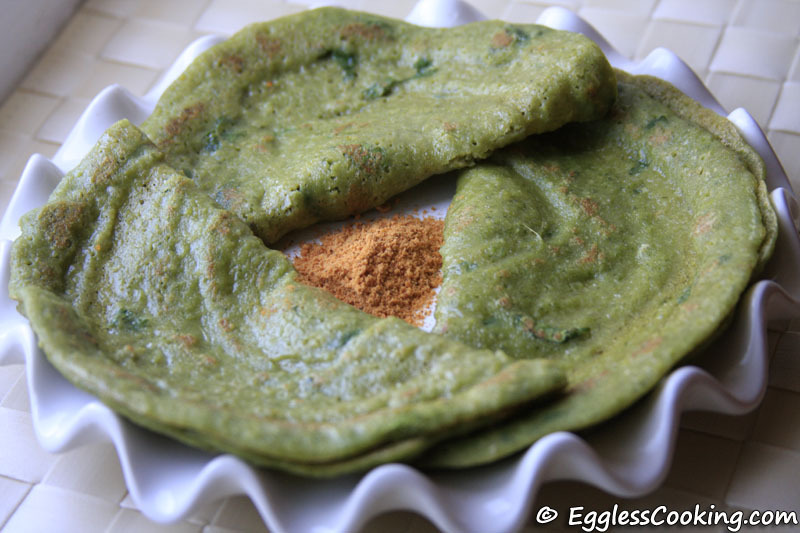 Green colored dosai, how cute. What is the name of the pancake mix that you found in Costco? If it is whole grains, I would definitely like to try it. BTW, I tried your Baked paneer – Indian style yesterday. Never tried marinating, I just bake them mixed with all the spices normally. We liked it a lot. Will post it soon. Thanks Divya for trying the marinading method. Anjali has mentioned that she uses the multigrain pancake mix. I’ve not tried it so far. Hmm.. I knew that brown rice was better but never found out why 🙂 Thanks for doing the research for us. Now, the difficult task would be to convince my Telugu husband to try brown rice. 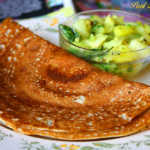 BTW, have you tried making dosa with Pancake mix? They come out pretty good. I actually found a very healthy multigrain ( made mainly with Oats,high in fiber,protein and calcium ) pancake mix in Costco and dosa from this mix come out really great. Anjali, we like the Chinese fried rice very much. But I’m not sure how well it would suit our Indian dishes. I have not tried the pancake flour dosa. I use the regular pancake mix and it has a hint of sweetness, so did not consider it for preparing dosas. Do you add any other spices?